Mixing the egg noodle dough will be the easiest part of this recipe. Combine 2 whole eggs, just under one cup each of all purpose flour and semolina flour, one generous pinch of salt, and one tbsp olive oil. Best bet is to mix this, by hand, in a bowl, then knead for a few minutes. It is best to have a fairly dry dough, in order to make rolling it out easier. Let this dough sit for half an hour. The point of this is to let the gluten that has developed from mixing and kneading, relax. After the rest period, I use a pasta roller to make thin sheets of pasta. You can use a rolling pin or bottle of wine, but that is going to be a lot of work. If you’ve got the muscle, the time, and the wherewithal, be my guest! 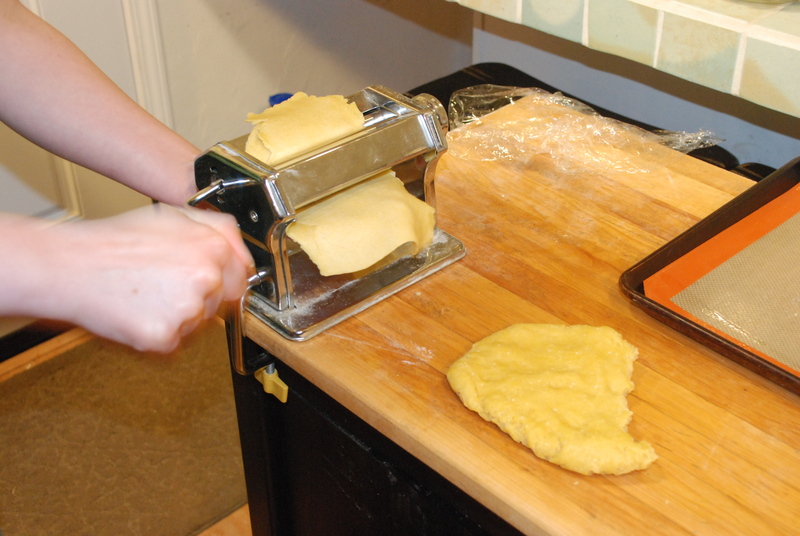 When you’ve got flat sheets of pasta dough, use a knife or pizza cutter to make rough cuts of noddles. Approx. half inch by six inches is appropriate. Uniformity here is not crucial. Allow it to look homemade and rustic. Dust with extra semolina flour to keep your noddles from sticking together. 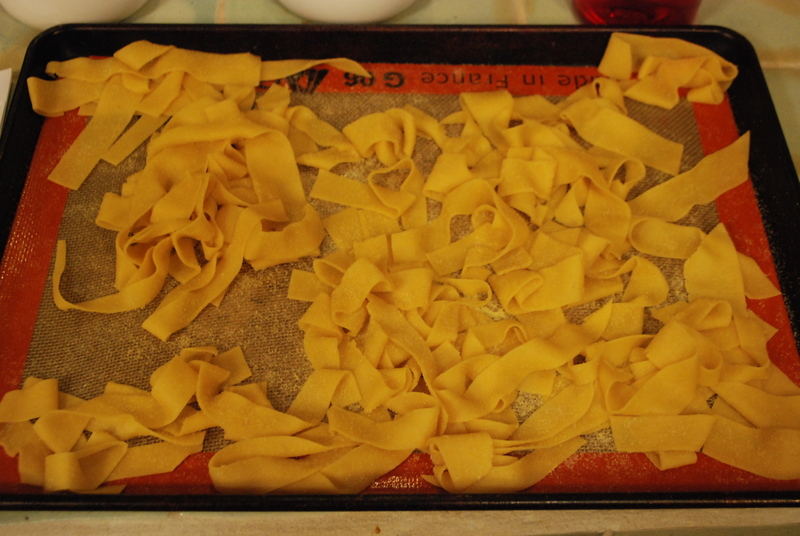 The first time I tried making homemade pasta, I put the noodles in a bowl and did not dust with extra flour… What a mess! It was just a rats’ nest off noddles that would not unstick from eachother. Unlike dried pasta, this only needs to be boiled for a few minutes in salted water. Just so everyone knows “ap flour” is all purpose flour 🙂 this recipe is amazing! Egg noodles are the best. would it be okay to use gluten free flour for this?